Families Bereaved Through Car Crime launch a new Facebook site during a hard-hitting demonstration by the PSNI and Fire Service at Sacred Heart Primary School in west Belfast. Holding the banner are from left James and Kevin Fitzpatrick and Tommy Holland. A Belfast group consisting of families who lost loved ones to so-called ‘joy-riders’ has firmly backed the News Letter campaign for stiffer sentences for drivers that kill. Families Bereaved Through Care Crime (FBTCC) spokesman Tommy Holland was speaking yesterday after launching a Facebook site to reach young people with a message about the devastation of car crime. 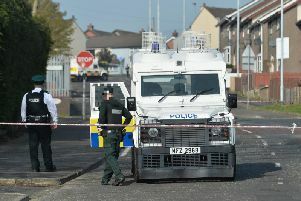 FBTCC was set up in 2002 after the death of 15-year-old Debbie McComb, who was killed by a prolific joy rider or ‘death driver’ as the group calls them, in west Belfast. Some 1,500 people have been maimed either through being hit by, driving or being carried in a car driven by so-called ‘death riders’ in Northern Ireland, he says. He strongly backs the News Letter-Johnston Press campaign for stiffer sentence for dangerous drivers. “This campaign will act as a deterrent to careless and dangerous driving,” he said. “These would definitely reduce if people considered the consequences of their actions. The group held a special event to mark national Road Safety Week at Sacred Heart Primary School on the Old Park Road in Belfast on Tuesday. It is the former school of eight-year-old Kevin Daniel Fitzpatrick, who was knocked down and killed along with his mother Dana by a ‘death driver’ in west Belfast in 2000. Kevin’s father, also Kevin, and his brother James attended his old school yesterday to mark the event. An annual cup is presented to a pupil at the school each year in Kevin’s memory. The entire school turned out to watch the PSNI demonstrate the use of a stinger device with patrol cars, to stop a simulated ‘death rider’. “The aim is to make it very clear to young people how car crime will give you a criminal record, impact on your family and cause the death or serious injury of other people,” Tommy said. The group previously presented a petition with 50,000 names to Lord Faulkner at Westminster and successfully created a new offence - Aggravated Vehicle Taking. They also lobbied for the creation of the highly successful PSNI Auto Crime Team in west Belfast.